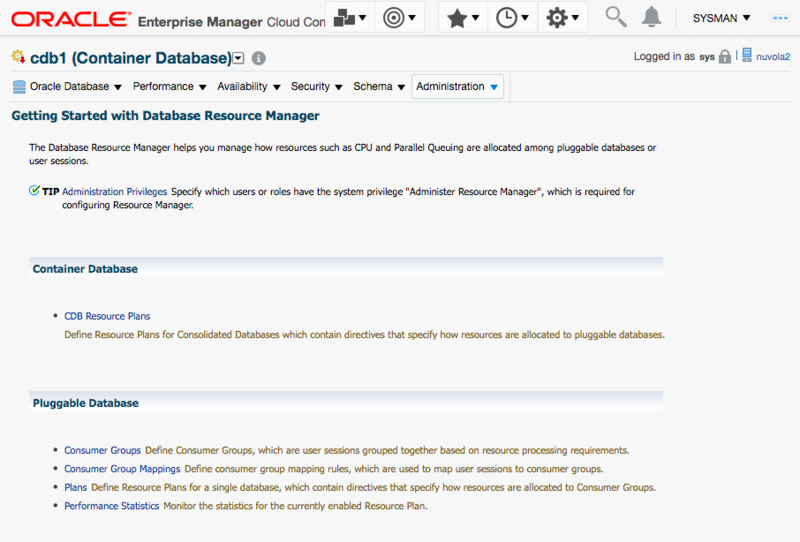 Oracle Database Resource Manager enables you to limit database resources. 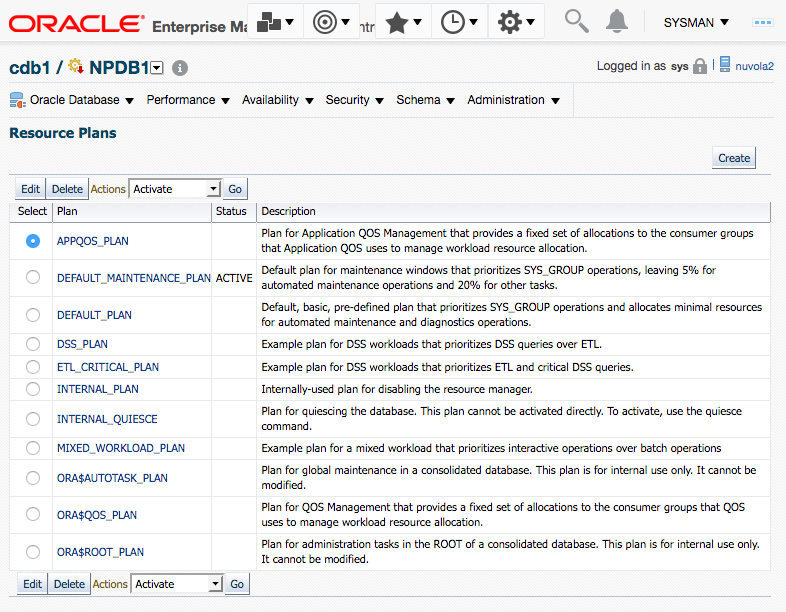 Oracle has been enhanced in this regard in its new versions; for example, in 12.1.0.1, Database Resource Manager supports multi-tenant architecture. One of the most common performance issues that DBAs have when they are consolidating several databases into a single database by using pluggable databases is that all the PDBs try to use as much of the resources as they can. The PDBs compete for resources. Even more critical, sessions inside PDBs that don’t have high importance can make a critical PDB slow. This can be a serious performance problem that can impact multiple users and applications. 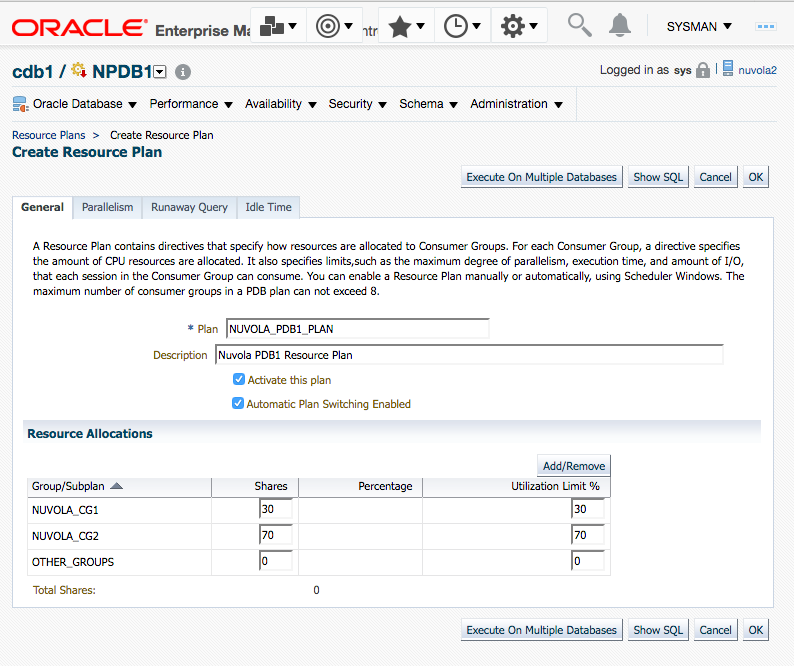 Oracle Database Resource Manager lets you specify how much of the resources you want to assign for every pluggable database; you can assign more resources to those PDBs that are more important and minimal resources for those with low importance. This prevents the low-importance PDBs from impacting the high-importance PDBs. Within a PDB or a non-CDB also, all the sessions compete for the resources assigned to the PDB. Sessions that have low importance can be using most of the resources, impacting the more important sessions. When Database Resource Manager is not used, a single session inside a PDB might use 95% of the resources that the whole CDB has assigned. This makes all the rest of PDB severely slow. 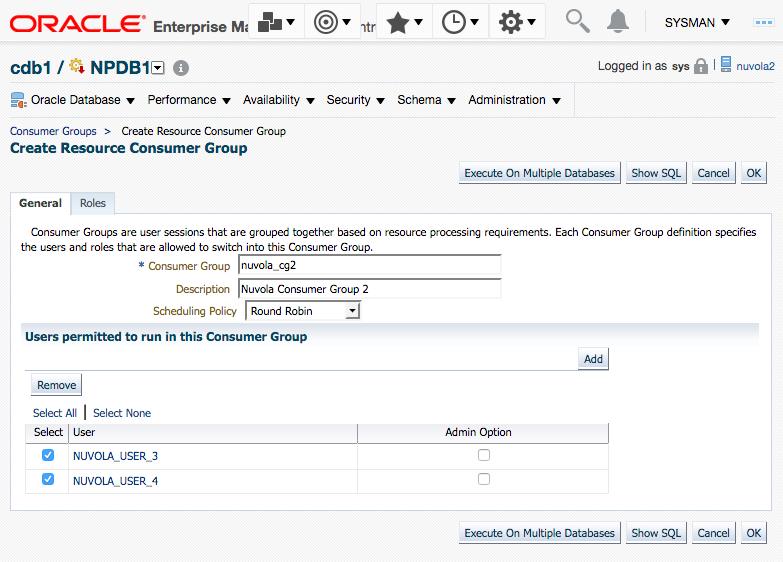 Inside a PDB or inside a non-CDB, Database Resource Manager enables us to assign resources to Consumer Groups, which comprise a group of users. You can group users into a Consumer Group with high importance and make another Consumer Group for the users that have low importance, and assign resources to them appropriately. SESSION_PGA_LIMIT: The maximum amount of PGA in MB that sessions in a Consumer Group can allocate before being terminated. 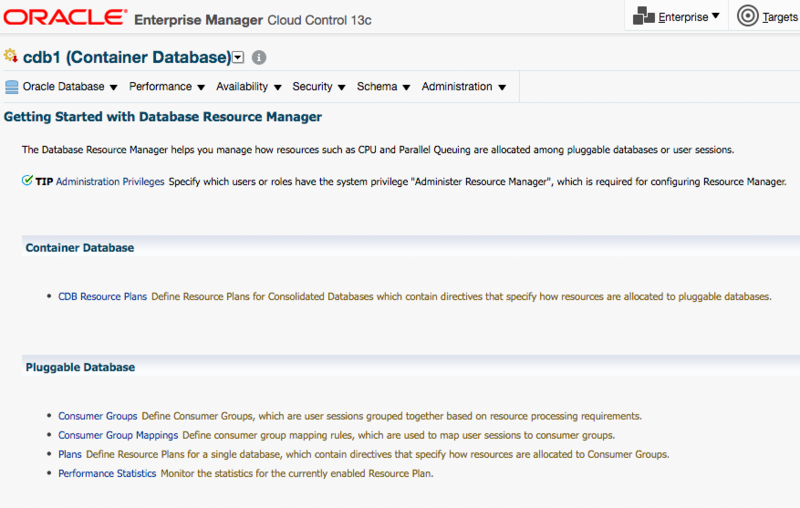 Oracle Enterprise Manager Database Express (EM Express) supports Database Resource Manager. 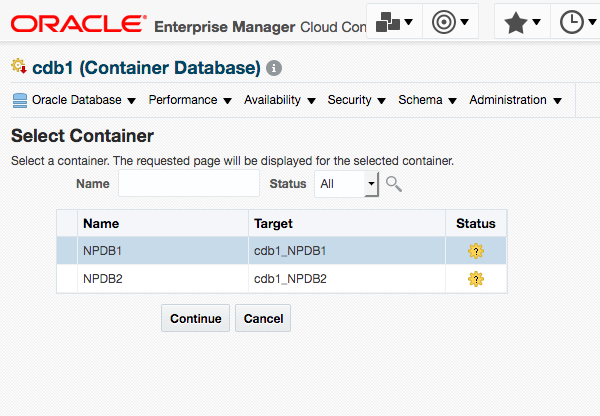 In this article we will see how to set up a Database Resource Manager configuration for a Container Database with two pluggable databases. 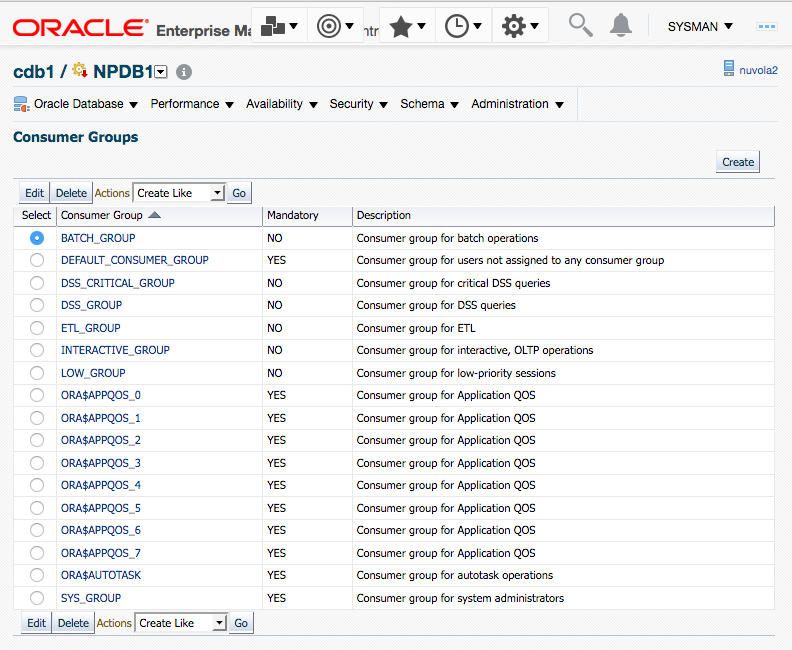 The version that we will use for this example is Oracle Database 12.2.0.1 Enterprise Edition. 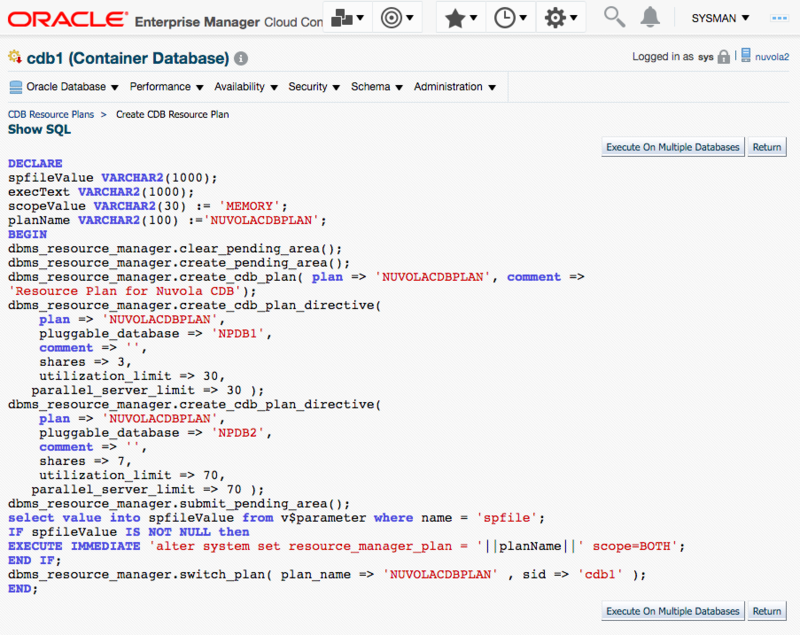 Go to the “Home Page” of the Container Database (CDB); in this case the CDB’s name is “CDB1”. In “Administration”-->“Resource Manager” you will see the following page. Click on the bottom “Create”. 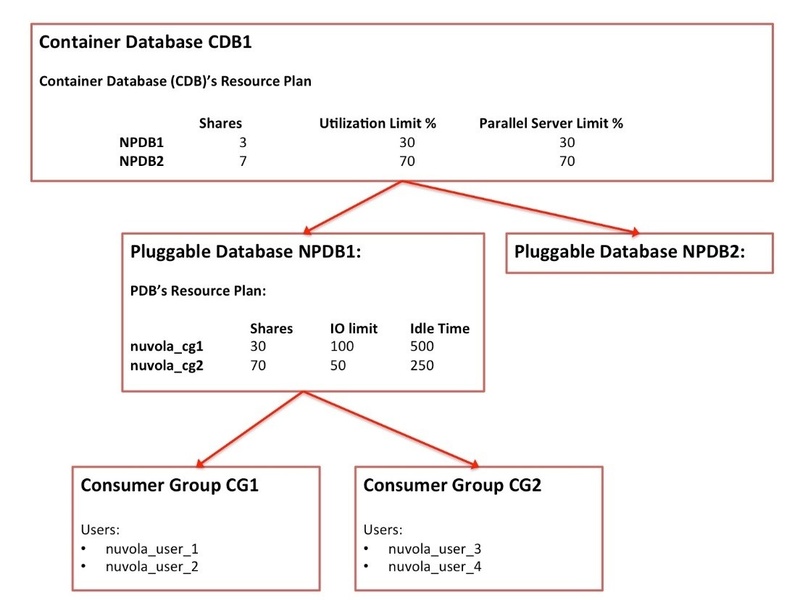 We will create a new CDB Resource Plan for our two pluggable databases NPDB1 and NPDB2. In this page, you will have to specify the name of the CDB Resource Plan, a description and a set of resources. The resources that you can assign are: Shares, Utilization Limit %, Parallel Server Limit %. However, there are more resources that you can assign. 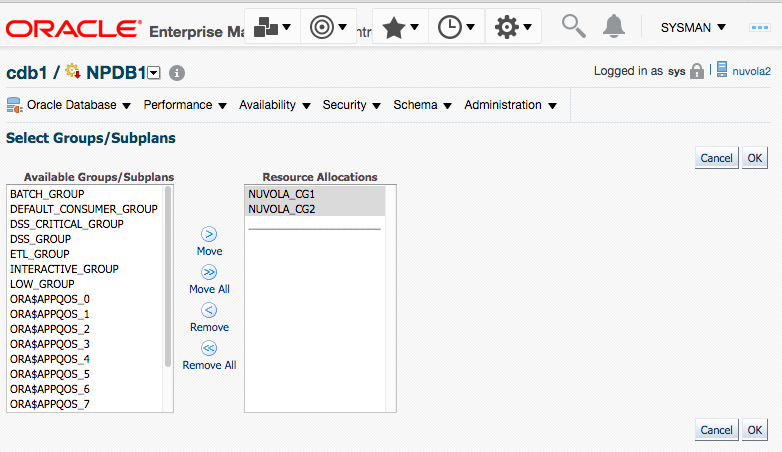 This is a downside of Oracle Cloud Control, because it is not synchronized with the options provided by the Oracle Database version (in this case 12.2.0.1) regarding the resources. 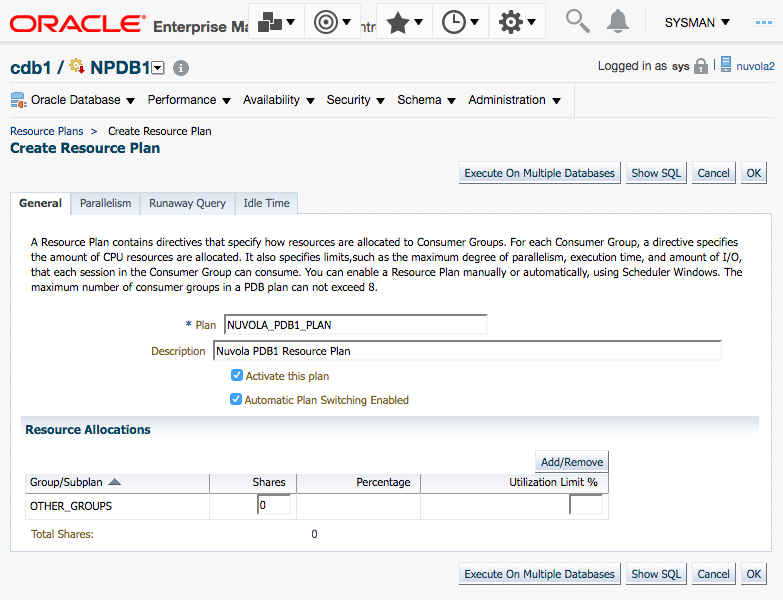 For instance, if we were using an Oracle Database 11.2.0.4 then Oracle Cloud Control should show us the resource options that 11.2.0.4 offers us, and if we were using 12.1.0.2 then it should show us the resource options that that version offers us, and so on. Unfortunately, Oracle Cloud Control 13.2 (in this example) and in previous versions offers us only the basic resource options. Of course, you can always change the SQL Statement, but that is another story. 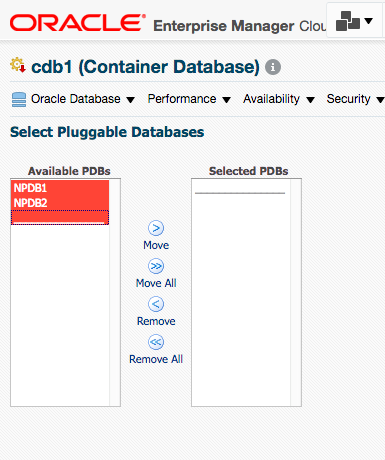 Click on the Button “Add/Remove” to add the pluggable databases NPDB1 and NPDB2. You will see the following page, where you have to transfer from the left side to the right side those pluggable databases you want to assign resources to. 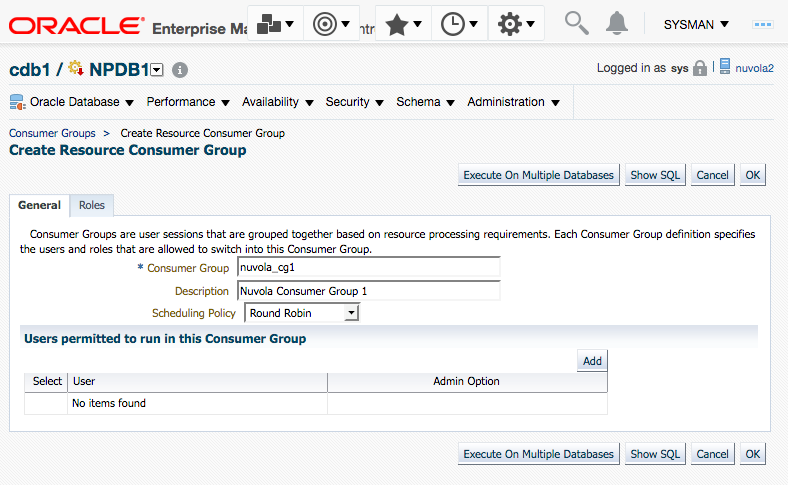 In this example, both pluggable databases were selected. Click in the button “Assign”. Then you will see the two PDBs listed; then we can assign them resources. In this example we have assigned some percentages and numbers to both PDBs and we have selected the option “Activate this Plan”. 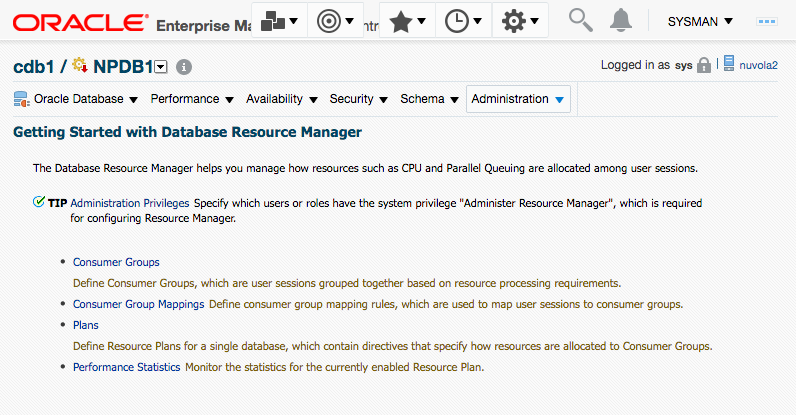 If you click on the button “Show SQL” you can see the SQL Statement that will be used to create the Resource Plan and to assign the resources. Click on the button “Return”. Click on the button “OK”. This will create the Resource Plan. 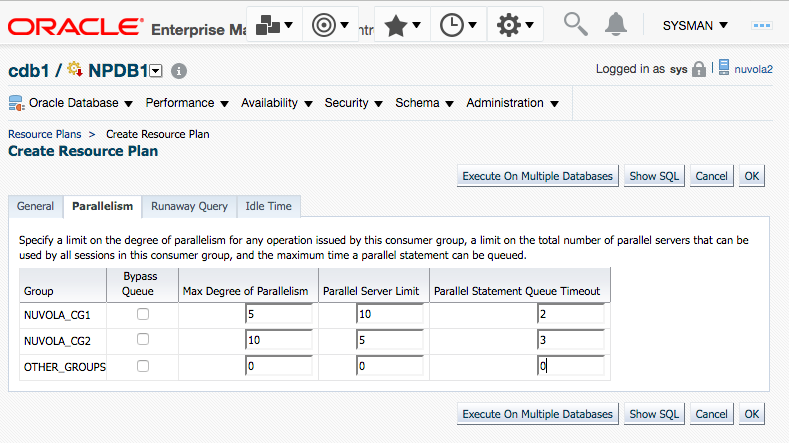 memory_limit: This parameter is applicable only to Oracle Exadata storage for configuring the Database Smart Flash Cache. 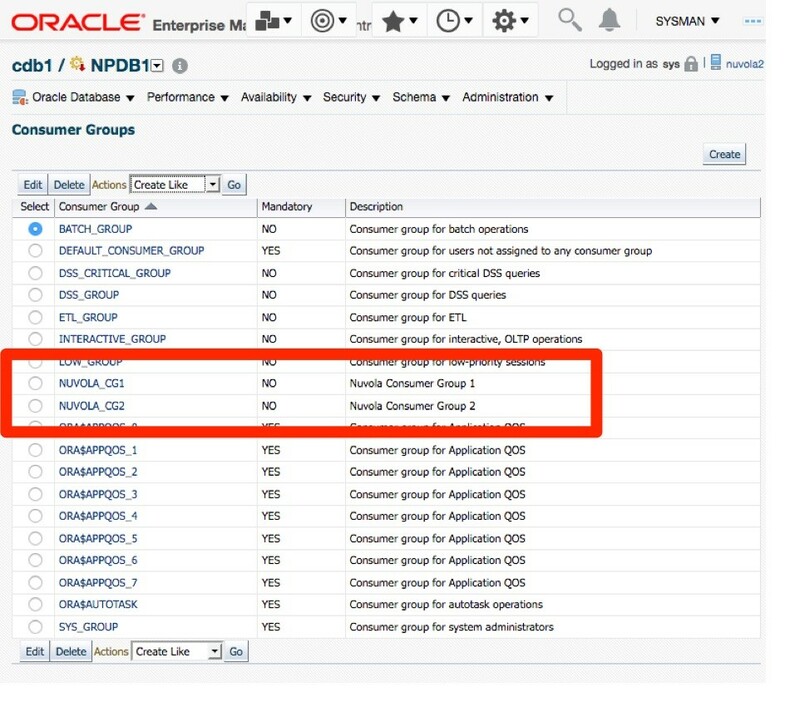 memory_min: This parameter is applicable only to Oracle Exadata storage for configuring the Database Smart Flash Cache. When I was reading the documentation I thought that these parameters were to limit the usage of the SGA for the PDBs, but it seems that they work only for Exadata. Perhaps in upcoming versions? I hope! Now go back to the “Home page” of the Container Database “CDB1”. “Administration”--> “Resource Manager”. We will select this time the option “Consumer Groups”. The Consumer Groups receive the resources assigned by Resource Plan Directives. We will see the following page where we have to select in which pluggable database we want to create the Consumer Groups. In this example, we will select the PDB called “NPDB1”. Click on the button “Continue”. In the following page, all the Consumer Groups will be listed. There are several already created by default. We will click on the button “Create”. In the following page we have to specify the name of the Consumer Group and a description. The name of the Consumer Group will be called “nuvola_cg1”. Click on the button “Add” so what we can add Users that will inside this Consumer Group. The users that exist in the PBD will be listed. In this example, I have filtered the users by the string “Nuvola”. The users “NUVOLA_USER_1” and the user “NUVOLA_USER_2” will be added to this Consumer Group. Click on the button “Select”. We will repeat the last two steps to create another Consumer Group.This time it will be called “nuvola_cg2”. For this Consumer Group, the users “NUVOLA_USER_3” and “NUVOLA_USER_4” will be added. Now there is only one step pending. To Create the Resource Plan Directive. A Resource Plan Directive specifies how the resources will be assigned to Consumer Groups. For this Go back to the “Home page” of the pluggable database “NPDB1”. “Administration”--> “Resource Manager”. We will select this time the option “Plans”. There are some Resource Plans already created by default. We will click on the button “Create”. 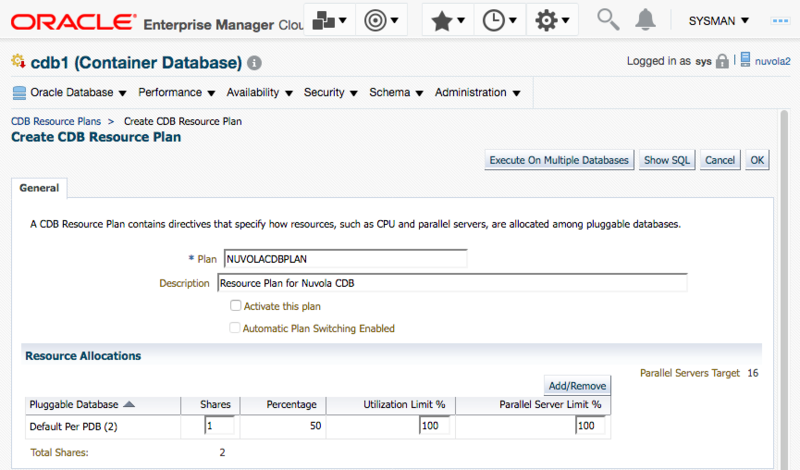 On this page we have to specify the name of the PDB Resource Plan and a description; in this case the plan will be called “NUVOLA_PDB1_PLAN”. Also on the second part of the page, “Resource Allocations”, we will specify the “Directive” where we specify how much of the resources will be assigned to each Consumer Group. Click on the button “Add/Remove” to add the Consumer Groups that we created previously. Select the two Consumer Groups that we created; in this example they are “NUVOLA_CG1” and “NUVOLA_CG2”. Click on the button “OK”. Click on tab “General”. Specify the resources that you want and click on the button “OK”. Click on tab “Parallelism”. Specify the resources that you want and click on the button “OK”. Click on tab “Runaway Query”. Specify the resources that you want and click on the button “OK”. Click on tab “Idle Time”. Specify the resources that you want and click on the button “OK”. 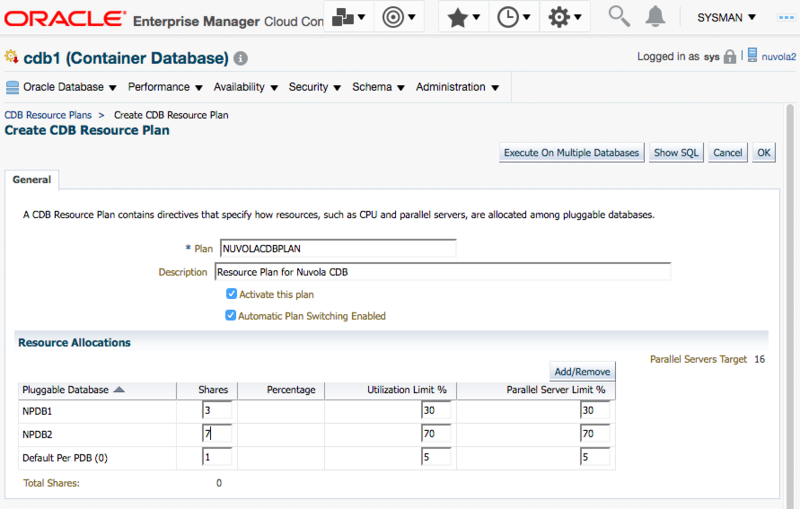 If you are consolidating non-CDBs databases into a CDB database with several PDBs it is highly recommended that you implement Database Resource Manager. 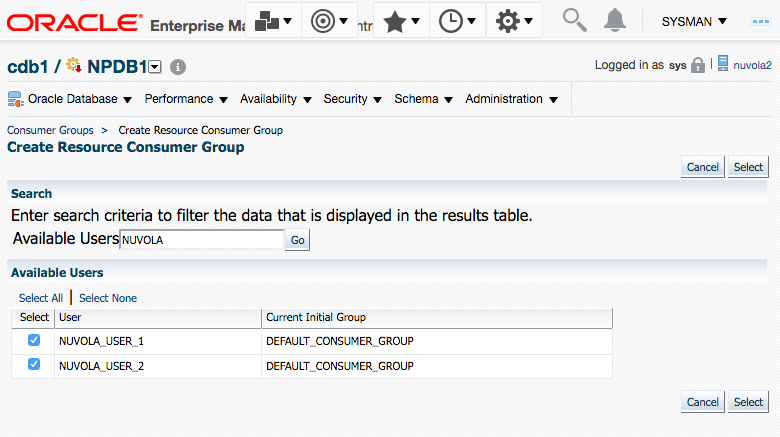 In this article I presented a step-by-step ecample that you can use as a recipe to implement a Database Resource Manager configuration and assign resources properly across PDBs and across Consumer Groups.